Visit any large metropolitan area in the world, and you'll feel theurgent need for innovative solutions to the many problems that facethe modern urban center. Geo-Space Urban Design offers a revolutionary proposal that willlead future urban growth quite literally in a differentdirection--down. 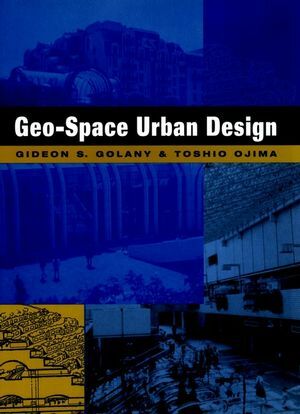 Gideon Golany and Toshio Ojima clearly demonstratethat subsurface urban expansion is not only practical and feasible,but also that it can reverse many of the negative effects normallyassociated with urban expansion. They present a comprehensive andsystematic plan for developing underground spaces fortransportation, delivery systems, infrastructure, residences,shopping and commercial spaces, and social and cultural activities.The authors focus on integrating geo-space with existingabove-ground structures and offer well-illustrated examples ofspecific design theories and methods. They also anticipate avariety of contingent issues, such as land ownership, legal rights,and psychological adjustment to underground living andworking. Three case studies of Japanese projects that use underground spacefor shopping, transportation, and infrastructure explore the entirespectrum of issues surrounding the design, construction, andongoing operation of the facility, including form, function, andefficiency; health, safety, and comfort; legal issues; and specialmanagement and security considerations. Geo-space projects inMontreal and Paris are also examined. Geo-Space Urban Design appeals to a broad range of professionals,all of whom have important roles to play in the creation andoperation of the cities of the future. For urban designers,architects, and civil and architectural engineers, this book offersboth an eye-opening vision and a challenge to create viable spacesthat will revolutionize urban life; landscape architects,geographers, and environmentalists will find opportunities toredefine the relationship between society and the natural world;and psychologists, social scientists, and government officials willdiscover new levels of human adaptability, interaction, andcooperation. The authors explore every facet of geo-space and point out thechallenges and opportunities these projects will hold for urbandesigners, architects, civil engineers, architectural engineers,landscape architects, geographers, environmentalists,psychologists, social scientists, and government officials. GIDEON S. GOLANY, PhD, is Distinguished Professor of Urban Designin the Department of Architecture at the Pennsylvania StateUniversity. He specializes in geo-space design, urban design withclimate, and new-town planning. Professor Golany has receivednumerous awards for his pioneering work in urban design andhistorical research, including a National Academy of Science Awardand several Fulbright Research Awards. A prolific author andeditor, he has published 25 previous books, including Ethics andUrban Design, Urban Underground Space Design in China: Vernacularand Modern Practice and Earth-Sheltered Dwellings in Tunisia:Ancient Lessons for Modern Design. TOSHIO OJIMA, PhD, is Professor in the Department of Architectureat Waseda University, Tokyo, where he is also Director of theAdvanced Research Center of Science and Engineering. He specializesin urban environmental planning, district heating and cooling,infrastructure, facility management, and remote sensing. Dr. Ojimais a prominent scholar and one of Japan's leading experts in designof the infrastructure. He has received awards from theArchitectural Institute of Japan and The Society of Heating,Air-Conditioning and Sanitary Engineers of Japan. He has writtenten previous books, most recently, Object to Development of TokyoBay Area. Geo-Space Transportation Facilities in Japan. International Uses of Geo-Space: Indigenous and ContemporaryExamples.